After checking into the lovely Hotel Whispering Willows at Shey, Madhu and I spent the afternoon lazing with a book in hand, relaxing. We planned on staying put for the rest of the evening as well. However, as the afternoon heat disappeared, Shey’s gorgeously green countryside beckoned us and we couldn’t help but step out for a stroll. A stray dog, definitely a Golden Retriever-mix, showed up at the gates of the hotel and decided to accompany us. Shey is an absolutely gorgeous Ladakhi village and probably the most picturesque one we’d been to. Its streets were wide and clean, and the villagers looked well-off with large homes and even larger fields. Since the main highway heading to Manali passes through it, traffic is incessant, especially with speeding tourist vehicles. As we walked along, we were a little careful not to come in the way of these. Apart from that, though, the village has a fantastic sense of calm, which was wonderful! Although, we hadn’t really planned on visiting the Shey Palace, we found ourselves at the base of the hill atop which it sits. The main entrance to the palace lay a further 500m down the road, but with directions from a couple of friendly locals, we found some roughly cut steps hewn into the mountain side by the rear of the palace. The dog followed us right until the base of these steps and then decided that he didn’t want to climb, so he simply turned away leaving us to negotiate the rest of the way. 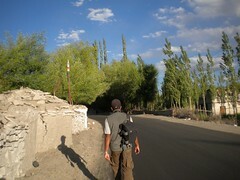 The climb up the hill, of which we’ve done many in Ladakh, was tiring but not too difficult. 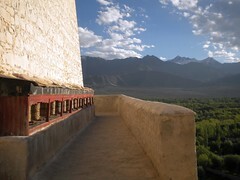 At the top, we emerged near the entrance of the Shey Gompa, which sits behind the facade of the palace. This facade has been recently reconstructed by the Archaeological Survey of India and therefore looks quite nice. 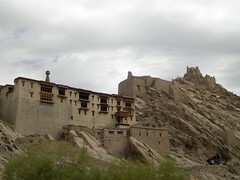 However, there’s hardly anything left of the rest of the palace except the Gompa. We first did a parikrama around the Gompa, turning the rows of prayer wheels and also taking in the fabulous views out to Shey village from that elevation. We seemed to be the only visitors around, probably because of the time of the day; most visitors to Shey visit it as a day trip from Leh in the mornings. Inside the monastery, we stepped into a small courtyard flanked by a shrine on one side and rooms for the monks on the other three sides. In the center was a lovely carved wooden structure with small windows at the bottom. When we peered in, we realized that this structure was the ceiling for a large prayer hall, which was at a level lower than the courtyard. We later learnt that this prayer hall is used when monks congregate in large numbers during festivals. A friendly Lamaji ushered us into the shrine, which housed an unbelievably pretty, 12m high bust of Sakyamuni Buddha. We had read about this statue and knew of its existence but even then were quite shocked and mesmerized by the sight of it. It had an enigmatic smile and a dark bluish black crown of hair, which was quite different from the other images of Buddha we had seen thus far. The walls and ceiling surrounding this statue were completely filled with murals. Strangely, all these murals and the Buddha image have been beautifully preserved over all these years! The Lamaji walked out of the Gompa with us and then pointed to a steep path that went past broken walls and rubble, climbing further into the mountain-side. He said (in halting, broken Hindi) that if we climbed to the level above, we could get fantastic views of the area around. We took up his suggestion and climbed up the path. It was slightly treacherous with loose gravel and slippery rocks. But we did get to a level above the monastery and just as the Lamaji had promised found the scenery to be truly magnificent. Spread below us were the green fields of Shey while behind us, perched on a higher elevation was something that looked like the remains of a fort. We walked along the rim of some broken palace walls and felt on top of the world! We were in such high spirits, that we decided to climb up to the fort as well; the views would be even more fabulous from up there. However, we had climbed about half way there before realizing that the sun would set soon; descending that rocky cliff in darkness would be downright dangerous! So, reluctantly, we turned around. Later, we sat at the base of a large Stupa outside the Gompa and watched the spectacular sunset beyond the mountains in the distance. It was picture postcard perfect and a perfect end to our fantastic evening in Shey.